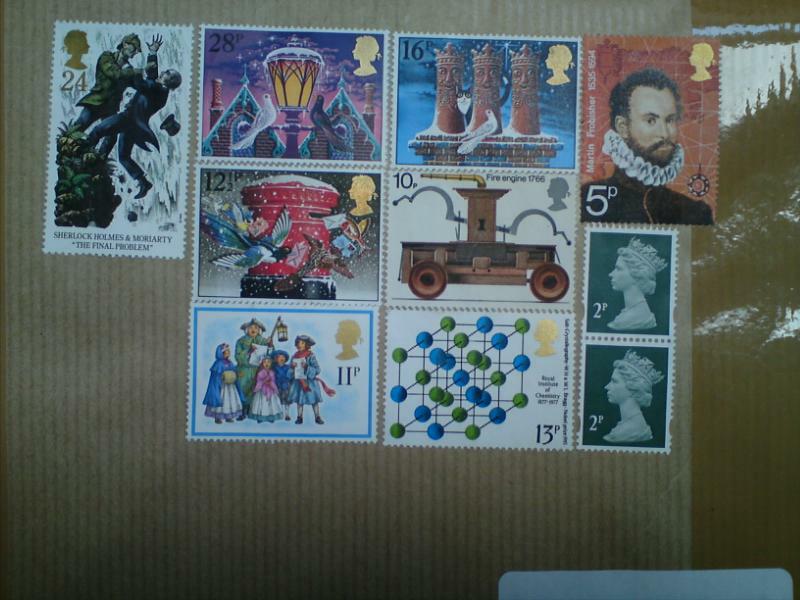 Just received this parcel today. It's an old out of print book I ordered via superfastbooksales on Amazon marketplace - and they were. 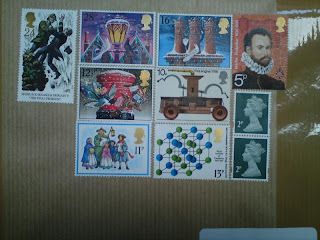 But look at the stamps - aren't they wonderful? They are mostly special issues from the 70s and I had several of them in my collection at the time. They're in perfect condition and what I like is that someone has taken the trouble to preserve them and stick them all on my parcel! Really appealed to my magpie instinct - and the designer in me. Made my day! And now I've discovered mobile blogging - so I might manage to post more regularly. And pigs might fly . . . ! Can't believe it has been 20 months since I have published anything here! A lot has happened in that time. Hazel and I have had a second set of C&G certificate students successfully complete their course. We have also developed two new courses - a one-year level 2 certificate course in response to requests from some of our beginners who didn't have time to commit to the longer course, and a level 3 diploma course to provide progression for those who'd completed the certificate. And that is a lot of work, believe me! We also had a student, Anna Jenkins, selected for the Further Education Gallery at the Festival of Quilts last year. That was a huge achievement for Anna, who was living with cancer at the time, and who was determined to make the most of every minute of her life. Her accomplished work was admired by many people, and we all enjoyed the experience, as Hazel and I went along to help her set up and man her stand. Sadly, Anna died just after Christmas, but it was a joy to have known her and be part of her life for a short time, seeing how she just got on with things and achieved so much. My lesson from her is to cut the displacement activity (this blog??) and JUST DO IT! Hazel and I also had the brilliant news that we had been selected to receive the Quilters' Guild first Travel and Education Bursary for teachers. This has enabled us to do a monthly course (Wet'n'Wild) with Claire and Leslie at Committed to Cloth, which I for one am enjoying immensely! It covers all wet processes for surface decoration of cloth - either to be used as art cloth in its own right or to be cut up and stitched into, as is the wont of quilters. The first two months were spent looking at dyeing processes and produced a 'family' of cloth dyed progressively from two colours, in light, medium and dark values, which were then overdyed in light medium and dark values of the second colour making a range of 16 different pieces in all. I chose black and brown for my colours, as I have never really worked with neutrals before. Boring! I hear you cry - but the fabrics produced were very interesting, and can now be printed on and further worked into - the focus of the next few months' work. The other fabrics were dyed using tray dyeing techniques, which produce stunning marks on the fabric. Although I have done this before, there is nothing like being taught exactly how to do something and then encouraged to experiment to improve the results. Both multicoloured pieces shown here were dyed in the same tray, and I got a bit trigger happy with the colours! I discovered that I don't like the effect of lemon yellow and scarlet together, and I positively hate the sludgy purple formed by scarlet and royal blue.On the positive side the markings on the top piece are great. I really like the depth in the middle. So encouraged by Claire, I overdyed it with 'double red' and the result can be seen below - it still has the depth, but the colours are a bit more unified. And here's a picture of Godfrey P Pussycat supervising the whole process! He's another thing that has happened (almost) since I've been gone. A native of Torquay, he was a new arrival in August 2009 as a kitten - and nearly lost one of his nine lives last week by getting himself shut in a shed over Easter - luckily the owner wasn't away for both bank holidays. He hasn't learnt his lesson though (typical boy! ), and was straight into our shed when I opened the door the very next day! Well, the title of this post was about displacement activity and being distracted, and that was because I came to it on a circuitous route via another blog, which was in turn a distraction from displacement activity - reading emails instead of planning next week's lesson for diploma students. Luckily tomorrow's another day, so I can do it then, and I'll post some more pics of fabric from the course, on a planned break from work - important for recharging creative energies - not displacement activity at all.